Facebook – Mạng xã hội phổ biến nhất hành tinh hiện nay đã bắt đầu cung cấp cho người dùng những biểu tượng cảm xúc để chia sẻ cảm giác như thế nào ở mỗi bài viết được đăng tải . Các biểu tượng cảm xúc gồm : Like (thích), Love(Yêu thích), Haha(Cười) , Sad( buồn), Angry (tức giận). Và Hôm nay mình sẽ hướng dẫn các bạn cách thay đổi biểu tượng Angry(tức giận) thành biểu tượng ” Dislike” nhé. Đầu tiên bạn tải tiện ích sau về trình duyệt mà bạn đang dùng nha: Tampermonkey. 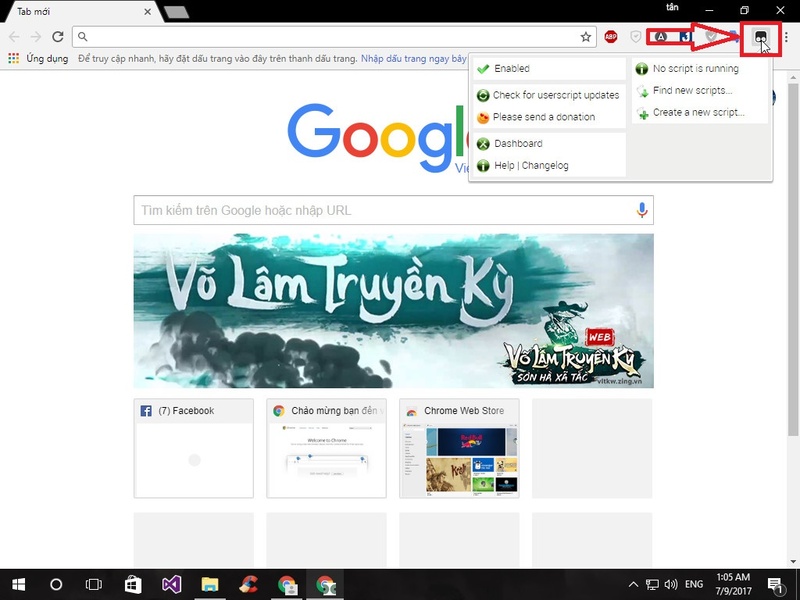 Ở bài viết này mình sẽ làm trên Chrome , các trình duyệt khác các bạn cứ tải rồi làm tương tự nhé. 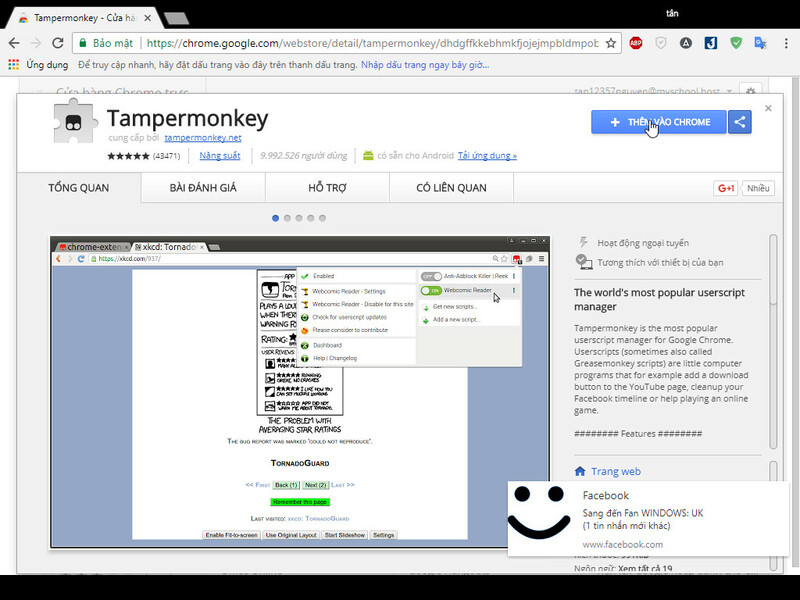 Sau khi nhấn vào link phù hợp với trình duyệt đang dùng thì bạn nhấn Thêm vào chrome ( Add To Chrome) , sau đó nhấnVào Thêm Tiện Ích . Vậy là xong bước đầu . 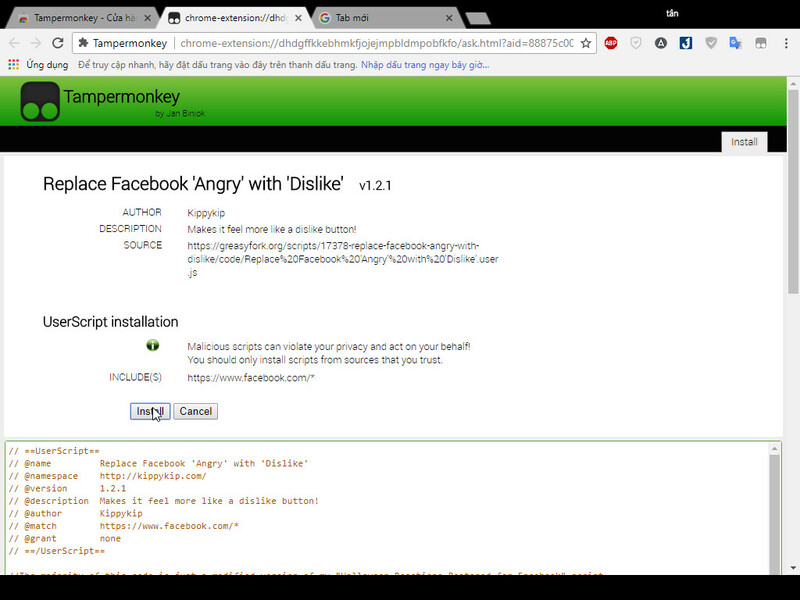 Bây giờ bạn hãy nhấn vào link bên dưới rồi sau đó nhấn vào nút Install nhé. 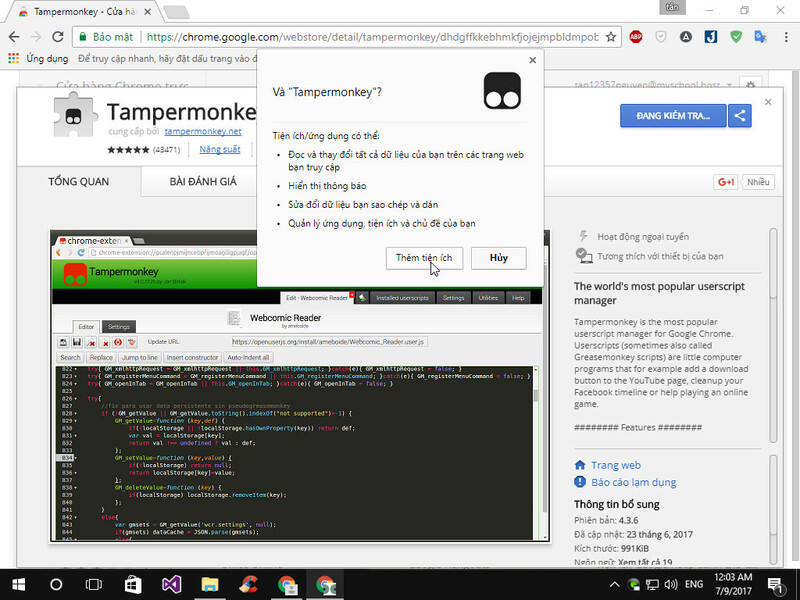 Bạn chỉ cần nhấn vào Install là xong mọi thứ rồi nhé. 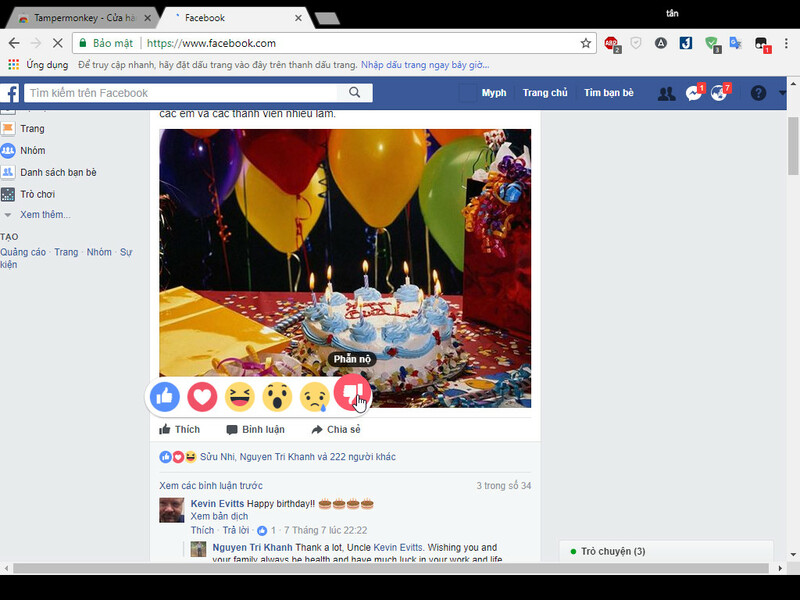 bây giờ bạn vào trang chủ facebook và kiểm ra thử thôi. Nếu như bạn thấy có biểu tượng như hình dưới thì bạn đã đổi thành công rồi nhé. 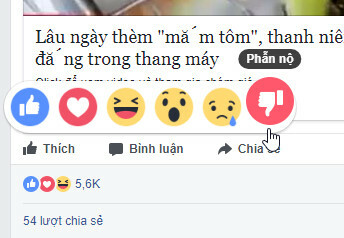 Nếu bạn vẫn chưa thấy thay đổi thì hãy nhấn F5 để reload lại trang facebook và thay đổi nhé. able to put these expired accounts to good use. to show that I’ve a very exccellent uncanny feeling I came upon exactly what I needed. I really appreciate this post. I have been looking all over for this! Thank goodness I found it on Bing. Youâ€™ve made my day! Thank you again! and personally recommend to my friends. I’m surre they will be benefited from this site. tto the blogosphere. Short but very achurate information… Thank you for sharing this one. I as well as my guys have already been reading through the best secrets located on your web site while quickly came up with a horrible suspicion I had not thanked the web site owner for those techniques. All of the people happened to be absolutely very interested to read them and now have simply been making the most of these things. Appreciate your truly being very helpful and also for having certain tremendous issues millions of individuals are really wanting to be aware of. Our own sincere apologies for not expressing gratitude to earlier. Admiring the dedication you put into your site and in depth information you present. It’s good to come across a blog every once in a while that isn’t the same old rehashed information. Excellent read! I’ve bookmarked your site and I’m adding your RSS feeds to my Google account. Hello, I would like to subscribe for this web site to obtain hottest updates, therefore where can i do it please help. Thank you for all of your efforts on this website. Ellie takes pleasure in going through investigation and it is simple to grasp why. Most of us hear all concerning the dynamic mode you convey priceless guides via the web blog and as well as boost contribution from other people on the subject then our favorite daughter is certainly being taught so much. Have fun with the remaining portion of the year. Your carrying out a remarkable job. I happen to be writing to let you understand of the cool discovery my friend’s child gained visiting your web page. She learned several details, with the inclusion of what it is like to have a great teaching style to make many more without difficulty learn about various impossible issues. You truly did more than visitors’ expectations. Thank you for coming up with such important, dependable, revealing not to mention fun thoughts on that topic to Lizeth. Thank you for your entire hard work on this website. Gloria enjoys making time for investigation and it is easy to see why. We all learn all relating to the powerful means you offer effective guidelines through your blog and foster response from website visitors about this issue so our favorite girl is in fact discovering a lot. Take pleasure in the rest of the new year. You have been doing a fabulous job. I just wanted to develop a brief word to express gratitude to you for those precious recommendations you are placing at this website. My rather long internet lookup has at the end been recognized with awesome concept to write about with my co-workers. I ‘d suppose that we site visitors are very endowed to be in a superb community with many brilliant individuals with insightful hints. I feel somewhat grateful to have encountered your web page and look forward to so many more enjoyable minutes reading here. Thank you once more for all the details. Thank you a lot for providing individuals with a very remarkable chance to read articles and blog posts from this website. It really is very enjoyable plus full of a good time for me personally and my office acquaintances to search your blog minimum three times in 7 days to study the new tips you have. And lastly, I’m just at all times fulfilled considering the breathtaking things served by you. Certain 4 facts in this posting are really the most effective we have had. Thanks so much for providing individuals with such a wonderful chance to read in detail from here. It’s usually very pleasurable and packed with a good time for me personally and my office friends to visit your blog particularly thrice weekly to find out the newest things you will have. Of course, I’m at all times satisfied considering the very good knowledge you give. Some 2 tips in this posting are completely the most impressive I’ve ever had. Thanks for all of the hard work on this blog. My mom takes pleasure in doing investigation and it’s really simple to grasp why. My partner and i notice all about the powerful means you make functional strategies by means of this website and as well as cause response from some others on this point and our child is without question studying a lot. Take pleasure in the remaining portion of the new year. Your carrying out a fabulous job. Thanks so much for providing individuals with remarkably pleasant chance to read in detail from this web site. It is always very great and packed with a great time for me personally and my office co-workers to search the blog no less than 3 times in one week to learn the new items you have. And definitely, I am also certainly happy with all the excellent advice served by you. Selected 1 tips in this post are in truth the finest I’ve ever had. I am only writing to let you know what a incredible discovery my cousin’s princess had browsing your web page. She learned some things, including how it is like to have an excellent coaching character to have other folks without problems fully understand specified very confusing things. You actually exceeded her desires. Thanks for distributing those invaluable, safe, educational as well as easy guidance on that topic to Lizeth. I’m just writing to make you understand what a excellent experience my child experienced reading your web page. She learned many things, most notably what it is like to have a very effective teaching nature to have folks clearly comprehend specified impossible things. You truly surpassed her expected results. Thanks for imparting the warm and friendly, dependable, revealing and as well as fun thoughts on the topic to Ethel. I wish to point out my affection for your kindness giving support to those who really need guidance on this particular concern. Your real dedication to getting the solution along has been astonishingly advantageous and has really permitted workers just like me to get to their goals. The useful report denotes a lot to me and somewhat more to my fellow workers. Thanks a ton; from all of us. I want to get across my appreciation for your kindness giving support to those people who really need help with this one question. Your special commitment to passing the solution up and down appears to be astonishingly beneficial and have enabled girls like me to attain their endeavors. Your personal valuable publication signifies much to me and even more to my mates. With thanks; from everyone of us. Thanks so much for giving everyone an extraordinarily remarkable chance to read articles and blog posts from this blog. It is usually so useful and also jam-packed with a great time for me and my office mates to search the blog at the very least thrice a week to learn the newest issues you have got. And lastly, I am certainly astounded considering the breathtaking opinions you give. Some 3 tips on this page are certainly the most impressive I have ever had. Thanks for all of your efforts on this web site. My aunt really loves doing investigations and it’s obvious why. My spouse and i hear all relating to the lively form you render priceless thoughts through your blog and therefore increase contribution from website visitors on that idea plus our own girl is discovering so much. Have fun with the rest of the new year. You have been performing a pretty cool job. I not to mention my friends were reading the good tricks on your website then quickly I got a terrible feeling I had not expressed respect to you for those techniques. Those boys ended up certainly warmed to read through all of them and now have quite simply been taking advantage of these things. Thanks for simply being indeed accommodating and then for considering some helpful useful guides most people are really needing to discover. My very own honest apologies for not saying thanks to earlier.